Divisibility and Indeterminate Equations of First Degree. Diophantine Analysis of Second and Higher Degrees. Prime Numbers. Number of Divisors and Their Sum. Congruences. Euler's Totient Function and the Theorem of Euler. Representation of Numbers by Decimals in a Given Scale. Continued Fractions. Legendre's Symbol and Jacobi's Symbol. Mersenne Numbers and Fermat Numbers. Representations of Natural Numbers as Sums of Non-Negative kth Powers. 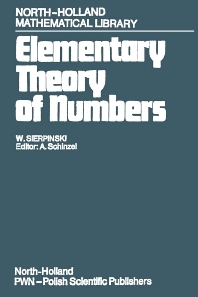 Some Problems of the Additive Theory of Numbers. Complex Integers. Bibliography. Index. Since the publication of the first edition of this work, considerable progress has been made in many of the questions examined. This edition has been updated and enlarged, and the bibliography has been revised.